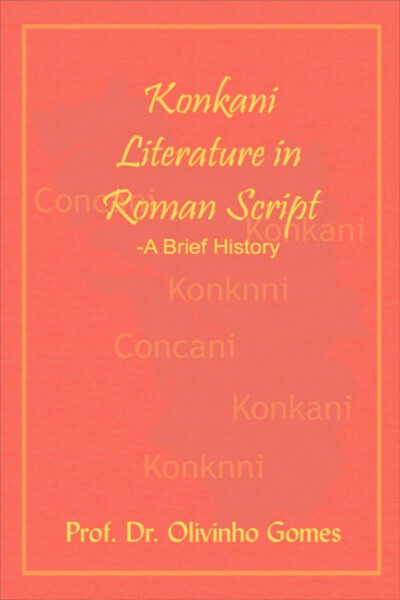 ‘Konkani Literature in Roman Script : A Brief History’ is a well-researched English book documenting the tireless efforts and contribution of various scholars, editors and writers who have enriched and strengthened Konkani in the Roman Script since 1556 when the first printing press was installed in Goa. ‘Konkani Literature in Roman Script- A Brief History’ is a well-researched English book documenting the tireless efforts and contribution of various scholars, editors and writers who have enriched and strengthened Konkani in the Roman Script since 1556 when the first printing press was installed in Goa. This book is Dr Prof Olivinho Gomes’ last contribution to Konknni language. This book not only gives us a glimpse of the invaluable contribution of Konkani writers in Roman script who have shaped our language through the years but it speaks volumes about the painstaking efforts made by Dr Prof Olivinho Gomes to gather information of immense value. Prof. Dr. Olivinho Gomes was the extraordinary Konknni person. The profoundity of his knowledge of every aspect o Konknni language was simply incomparable. He was the ultimate in the field of Konknni. He was an eminent Konkani scholar and former acting vice chancellor of the Goa University.